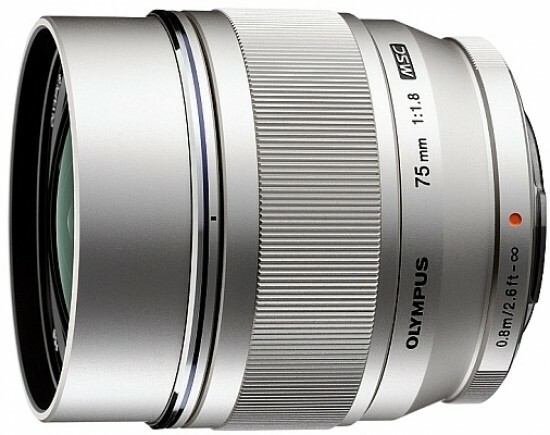 The Olympus M.ZUIKO DIGITAL ED 75mm F1.8 is a new telephoto portrait lens for the Micro Four thirds system. Offering an effective focal length of 150mm in 35mm terms, the all-metal Olympus 75mm lens is perfect for portraits, high-speed indoor sports and stage shooting in low light. The Olympus M.ZUIKO DIGITAL ED 75mm F1.8 lens will be available from July 2012 for £799. The optional LH-61F lens hood costs £69.90 and the LC-61 lens cap £39.90. LONDON, 24 May 2012 – For owners of Olympus Micro Four Thirds cameras, a new lens has to offer more than stunning optical quality –the design has to live up to the beautiful, retro-styled O-MD and PEN series as well. The M.ZUIKO DIGITAL ED 75mm 1:1.8 (150mm*) ‘Prime Portrait’ lens ticks all those boxes and more. The ideal choice for portraits, high-speed indoor sports and stage shooting in low light, it has the sleek, full-metal housing to match its impressive specifications and spotless optical performance. From picture-book bokeh to virtually silent, high-speed autofocus, this large-aperture beauty has everything the serious enthusiast could ask for. The Prime Portrait lens is available from July 2012, for a remarkably low £799. The large aperture of the new Olympus lens is perfect for low-light and high-speed photography. Combined with the long focal length, it also helps generate the shallow depth of field needed to highlight subjects against an intentionally blurred background – an ideal effect for shooting portraits. For sheer quality, ZUIKO’s ultra-high precision assembling and polishing technology puts the Prime Portrait neck and neck with the fantastic ZUIKO DIGITAL ED 150mm 1:2.0. Clear and sharp images are a matter of course, with edge-to-edge high contrast and resolution.Lightweight and compact, the Prime Portrait is a pleasure to work with in manual mode. The all-metal design has a reassuringly premium feel and the fine-tuned focus ring is a cinch to use. The ZUIKO Extra-low Reflection Optical (ZERO) coating is twice as effective as conventional coatings, giving you the confidence to shoot in bright light without fear of ghosting and flaring. What’s more, this lens also delivers reliable circular bokeh without the dreaded vignetting or off-axis aberration. Several optional all-metal accessories are available to round off a sleek lens package, including the LH-61F lens hood (£69.90) and the LC-61 lens cap (£39.90), both from Olympus. The RRP for the M.ZUIKO DIGITAL ED 75mm 1:18 Prime Portrait lens is £799. Product specifications are subject to change without notice. Please check the Olympus website at http://www.olympus-europa.com for the latest specifications.